These 3 funny companions will never leave baby only during bath time! BPA Free. 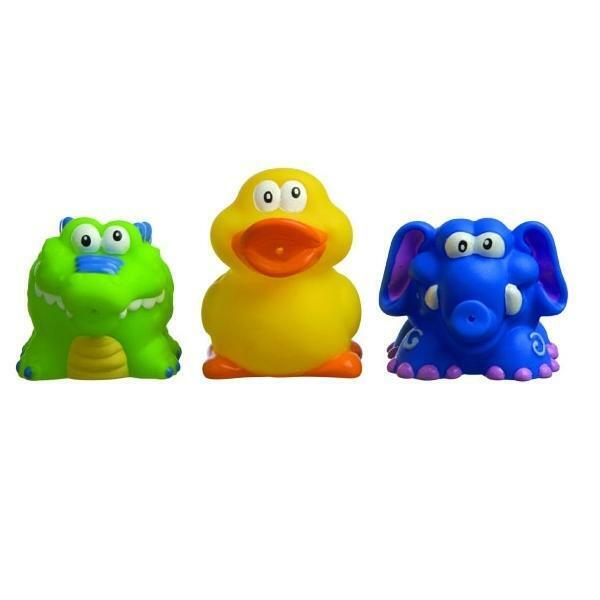 Pack of 3 bath squirters. BPA and phthalate Free in accordance with the safety regulations. Nuby was founded by the parent company Luv n' Care® in the 1970's. The Nuby brand develops a range of innovative, high-quality children and baby products. The brand has a complete range of baby care products from, baby bottles, to teething rings, baby dishes, dummies and even toys! The baby care products are free from Bisphenol A and designed to make the lives of parents and children easier. Nuby is distributed in over 155 countries around the world and is loved by millions. Research, design, safety standards and innovation ensure the quality of Nuby products. Explore the Nuby range at Greenweez and discover the wide selection of baby care products.